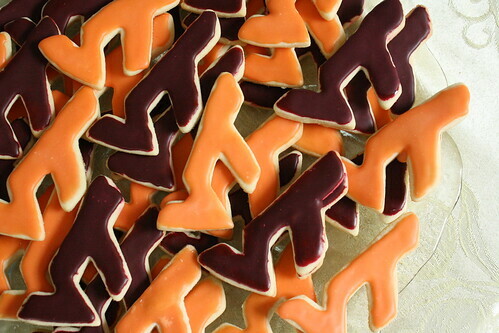 in honor of the hokies snapping out of their little losing streak, i am honored to share these delightful cookies and my best of the best sugar cookie + icing recipe. 01. in a large bowl, cream together butter and sugar until smooth. beat in eggs and vanilla. stir in the flour, baking powder, and salt. cover, and chill dough for at least one hour (or overnight). 01. in a small bowl, stir together confectioners' sugar and milk until smooth. beat in corn syrup and almond extract until icing is smooth and glossy. if icing is too thick, add more corn syrup. 02. divide into separate bowls, and add food colorings to each to desired intensity. dip cookies, or paint them with a brush. a perfect sugar cookie for christmas, or any holiday! this recipe cuts in half very easily. i wish you a wonderful first-weekend-of-november.